Already Working with a Medical Billing Service? Get better Rates with medical-billing.com! If you have a suspicion that you could be getting better results with your medical billing, you are correct. Medical-Billing.com, a leading provider of medical billing services in the U.S., provides premium service to hundreds of practices on a local and national level. There’s a reason that most of our new business comes from referrals from other physicians – and that is the excellent support and service we give our clients. 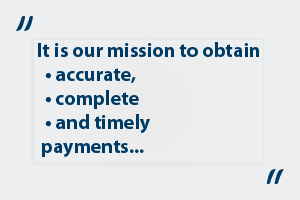 It is our mission to obtain accurate, complete and timely payment from all third party payers and patients for our clients using state-of-the-art technology, proven billing methodologies, effective control systems and highly trained staff.Not all physicians are alike and the same goes for medical billing companies. With over 30 years of experience and multiple locations across the U.S., we are proud to deliver excellent results for our physician partners through a relentless focus on customer service, efficiency, technology, training and measurement of metrics. We only get paid when you get paid. So whereas denials can run up to 20% or more of a practice’s billing, our average across hundreds of practices is much lower. 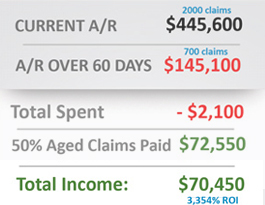 Medical-Billing.com allocates over 50% of its billing costs to the successful collection of the last 20-30% of charges that typically do not get paid on first submission. Resolution of these claims can require up to 10 times more effort to resolve and achieve payment. Most practices, and even medical billing companies, have limited resources that almost never have the time to do this work completely. A function-based and systematic approach to accounts receivable management that ensures all necessary billing, payment and follow-up activities are performed in a timely manner throughout each claim’s life cycle. •	Each client has uniquely assigned Client Managers and Billing Supervisors that are responsible for daily client communications and issues resolution. Today our clients enjoy the benefits of accounts receivable management that on average rank better than the top 25th percentile of multi-specialty group practices nationwide as surveyed by the Medical Group Management Association and Healthcare Billing Management Association for Days Revenue in AR. Our clients on average get paid faster than 75% of all group practices in the U.S.
Find out today how Medical-Billing.com can help you improve your bottom line with higher reimbursements and lower costs. Excellent service! And very attentive people and knowledgeable! "We are very pleased with the work that has been done, and I would highly recommend Medical-Billing.com and their team to anyone that needs to improve health care collections." "Medical-Billing.com and its consulting team did a phenomenal job collecting our old receivables when we sold our skilled nursing facility. We collected far more than we expected to." 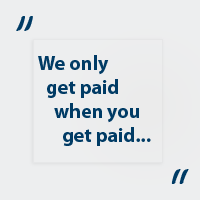 We only get paid when you get paid -- Our medical billing specialists are dedicated to getting as much of your money for you as possible. . Medical-billing.com allocates over 50% of its billing costs to the successful collection of the last 20-30% of charges that typically do not get paid on first submission. Our system speeds up the entire process, from data entry to claims submission. For a seemless transition from your current medical-billing provider to medical-billing.com, call or contact us today. "We are very pleased with the work that has been done, and I would highly recommend Medical Billing and their team to anyone that needs to improve health care collections."